The Right Reverend Dr Peter Stuart was installed as the 14th Bishop of Newcastle on 2nd February 2018 at Christ Church Cathedral, Newcastle. One way of striking up a conversation with Bishop Peter is to talk about musical theatre, running or Celtic spirituality. Another way is to talk about his enjoyment of visiting parishes, the work of our Anglican caring agencies and schools. Bishop Peter came to the Diocese in 2009 after serving in ministry in Tasmania and South Australia. He served as Assistant Bishop and twice served as the Administrator of the Diocese. 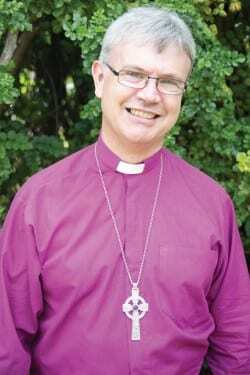 Bishop Peter was born in England in 1963 and emigrated to Cabramatta in 1971. He has since lived in Tasmania, Victoria and South Australia before returning to NSW. He is a graduate from the University of Tasmania (Bachelor of Commerce), the Melbourne College of Divinity (Bachelor of Divinity), the University of Technology Sydney (Master of Management) and Flinders University (Doctor of Education). Prior to becoming a bishop, he was involved in parish and diocesan ministries including ministry development, theological education, and administration. He has served parishes in rural, suburban and inner-city settings. From 2002 until 2009 he was the Principal of St Barnabas Theological College Adelaide where he taught practical ministry, missiology, and sociology for ministry. His ministry interests involve deep passion for social justice issues especially the inclusion of all people as equal citizens. In his teaching ministry he is focussing on Centering Prayer – the way of being silent and attentive to God. In 2016 he tried a couch to 5k app and found that after a couple of months he could run 5 kilometres. Most Saturdays he can be found at a Parkrun. Bishop Peter is married to Nicki and they have two adult children. You can writings by Bishop Peter here. Newcastle Anglican © Anglican Diocese Newcastle.